Ardaite is a very rare sulfosalt mineral with chemical formula Pb19Sb13S35C17 in the monoclinic crystal system, named after the Arda river, which passes through the type locality. Ardaite is a rare sulfosalt mineral, discovered in 1980 from Madjarovo, Arda River, Bulgaria. It was named after its place of discovery. It was the second well-defined natural chlorosulfosalt, after dadsonite. Ardaite is an opaque, green-gray mineral that is formed as aggregates, or needle-like crystals visible only with microscopes. Greenish-gray or bluish green in color, its luster is metallic. 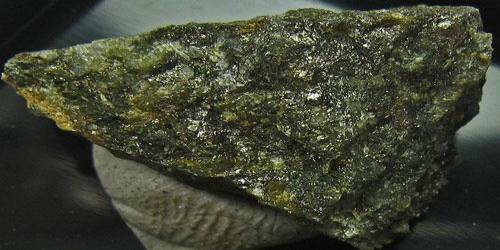 It has a metallic luster, and a relative hardness ranging between 2.5 and 3. 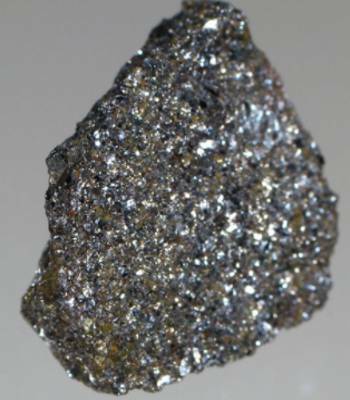 Ardaite occurs rarely in polymetallic ore deposits. It occurs as 50 µm fine-grained aggregates of acicular crystals associated with galena, pyrostilpnite, anglesite, nadorite, and Cl-bearing robinsonite and semseyite, in the Madjarovo polymetallic ore deposit in Bulgaria. Ardaite has a hardness of 2.5 to 3 on Mohs scale and a density of approximately 6.44. The type locality is the Madjarovo polymetallic ore deposit in the Rhodope mountains. Later its occurrence was proved in the Gruvåsen deposit, near Filipstad, Bergslagen, Sweden. The minerals that are closely associated with ardaite include graphite, nisbite, arsenopyrite, antimony, silver, pyrargyrite, stannite, scheelite, magnetite, chalcopyrite, pyrrhotite, sphalerite, anglesite, argentian tetrahedrite, pyrostilpnite, chlorian semseyite, chlorian robinsonite, and galena.